Pericardiocentesis may be used as a treatment. If too much fluid builds up in the sac, this can put extra pressure on the heart. This is known as cardiac tamponade . It is a life-threatening condition. Withdrawing some of the fluid will help to relieve the pressure on the heart. Pericardiocentesis may also be used to diagnose the cause of fluid buildup. Fluid buildup is known as pericardial effusion. The buildup can be caused by an infection, cancer, trauma, autoimmune disorders, or drug use . It may also indicate the presence of rheumatoid arthritis , heart attack , or kidney failure . Pericardial effusion and tamponade. EBSCO DynaMed Plus website. 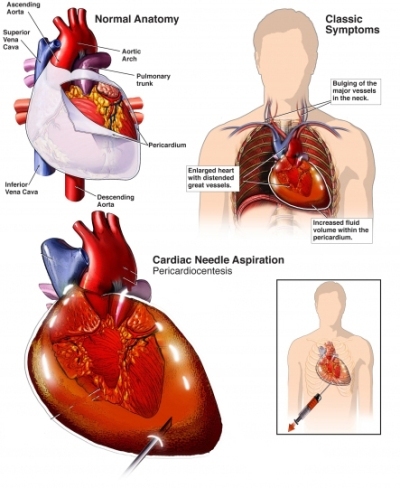 Available at: http://www.dynamed.com/topics/dmp~AN~T114102/Pericardial-effusion-and-tamponade . Updated June 15, 2017. Accessed November 30, 2017.